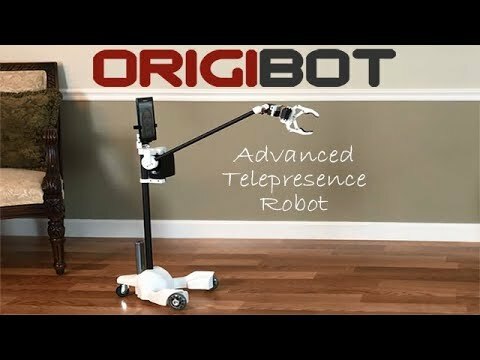 ORIGIBOT2 is a next generation telepresence solution. The robot has been updated with a sleek and functional carbon fiber frame, an additional wrist tilt action, improved motors and stronger servos. You connect remotely to ORIGIBOT2 from anywhere in the world on most any device with an Internet connection (Android, iOS, Windows, Mac). Not only do you have two-way audio and video, but also full control of the robotic platform, arm, and gripper. How awesome is that? A full 7 degrees of freedom (including the robot base) to interact with the remote environment! Using ready-made hardware, including an Arduino controller and Android tablet, Origin Robotics has ensured a low entry-level price. Prices start at $599,- on indiegogo.